We got our first set of sponsors for The Hot Mommas® Project 2008 Case Study Competition. This blog talks about who they are, and how we got them. The bottom line is RELATIONSHIPS. (Click here to get to the main Hot Mommas Project site which has links about the case study competition). 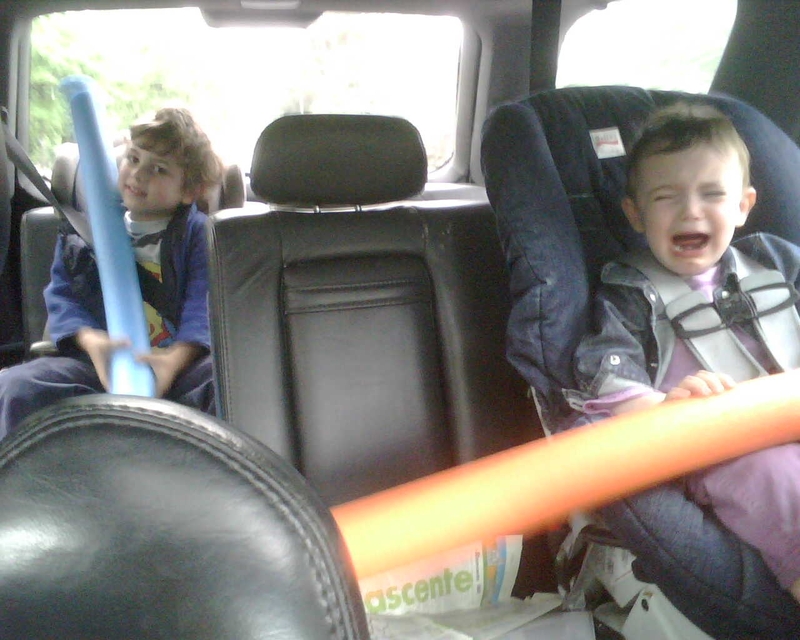 Pictured left is my son, Maxwell, and daughter Lilah who is traumatized by Maxwell hitting her with one of those noodle toys people use in the pool. If Maxwell could read, he would learn from this post that relationships make everything happen and that he should not – I repeat NOT – hit his sister with the noodle. a. What’s in it for me? Be sure to answer this question for sponsors. For some it’s the networking at an event, for others its the visibility, for others a combination and/or other goals. b. Ask, don’t tell. Ask them what they liked and didn’t like about past sponsorships. Be cognizant of this during your interactions. c. Search Guidestar. Julie also encouraged us to search www.guidestar.com and print the c90s (tax forms) of similar causes to get a flavor for who is sponsoring what. d. Use templates. Like a little sponsorship angel, Julie encouraged us to check out the NFTE DC office’s sponsorship links as a sample (sponsors, form). e. Develop host committee. Getting a host committee going was another suggestion – this formally honors champions who are tapping their networks for your cause. We’ve decided to tap people who are willing to email their network of over 100 people. 2. Develop a sponsor packet. Click here for our sponsor and partner packet. It is a pretty shameless copy of NFTE Greater Washington’s. As a rule, I like to find friends who are willing to share their templates. I do the same thing from my end. 3. Develop measurable/trackable goals, make asks. Esther and I (Esther is my “right hand man” – see previous post) have developed a very specific goal of 5 asks per day (each). This is a little more involved than it sounds, because many pre steps must happen before we can approach a potential sponsor or partner (research, writing letters, editing letters, getting coffee, etc.). Having a TARGET NUMBER has helped us a great deal. We agree that the 5 asks per day (and – this is part time – so it is 2 days per week) is our number one priority. Although, one might not guess this based on how miserably behind I am on my target. But, 5, each, Tuesday and Thursday is the target. Because this is the first Case Competition we are willing to operate without salaries and cover costs only. Of course, the ideal is to have a salary and have a cash reserve for next year. We have developed a budget, which I’m sure will change. Click this link ( module-3-exercise-3-4_33108) for a really basic financial planning curriculum I developed for NFIB’s Young Entrepreneur Foundation and Visa’s Practical Money Skills (start at page 7 if you want to build very simple financials). 4. Results – Secure Sponsors. Here are the sponsors we just confirmed this week. We want sponsors to INCREASE our revenue, and/or DECREASE our expense line items. – The George Washington University, Center For Entrepreneurial Excellence (through the generosity of Linda Rabbitt). Dr. Erik Winslow – who is pretty much the mac daddy of the Women’s Leadership Program at GW – walked into my office last week. He tells me Linda Rabbitt – big time entrepreneur and donor to GW – was interested in the Hot Mommas Project and part of a donation is being earmarked for us. That is the REVENUE side. GW also donates office space to the Hot Mommas Project thus allowing us to reduce an EXPENSE line item. What led to this: I have been updating George Solomon and Erik Winslow (GWU Center for Entrepreneurial Excellence Co Founders) for years. They have been there every step of the way. Linda Rabbitt: Click here or here for additional info on major stud Linda Rabbitt. At the bottom of this post, you will find article from when she was honored as a Washingtonian of the Year. She is such an incredible person I had to include the entire piece. -FMS, Inc. FMS is our technology partner. They are reducing an EXPENSE line item for us. FMS is owned by Luke Chung (an EO member). Veteran FMS employee Dave Juth (a GWU Alum) is our project lead. What can we offer? Aside from being fun and interesting, we included them in some news coverage of the Hot Mommas Project coming out of GW. Click here to see article. What led to this: I have been friends with Luke Chung for years. I am a huge fan. When I needed to talk with a tech expert, he came to mind first. I was shocked when Luke said they could help us out. Because we are cause-related, they are giving us a discount. The big takeaway here is the people you know can help you. We are in a good position because of the connections with which we are starting. This is why people say networking is important. But I don’t like it when people are just users. My goal and approach is to be a decent person and maintain the relationship out of genuine interest, not because of what the project or I can get. I love these guys (mentioned above). Lots of good business karma going around as a result. For ongoing sponsorship development, I’ve been advised by Tony Sudler – head of the Alzheimer’s Association, National Capital Area – to diversify the sponsor base…ideally 25% for each category an organization might have (e.g., planned gifts, corporate, individual, etc.). This is a smart tactic which helped the association post 9-11 and post Tsunami when many donors’ dollars were diverted. The Sponsorship Seeker’s Toolkit was recommended to me, but I have not been using it. I have used it in the past. “Volunteering is a way of life for me,” says Linda Rabbitt. Owner of Rand Construction, a business she built from the ground up, she is involved in so many community groups that her husband has threatened to enroll her in “Just Say No” school. Rabbitt is the immediate past chair of the Greater Washington Board of Trade, only the third woman to head the 115-year-old organization. She spearheaded creation of the Washington Collaborative, moving the Board of Trade and community organizations that work with the business community into one building where they could share space, resources, and ideas. Rabbitt also raised almost $1 million in in-kind contributions to rehab that building. “We’re building communications through physical space,” she says. As CEO of the area’s third-largest female-owned business and a leader of the Washington Building Congress and CREW (Commercial Real Estate Women), Rabbitt has encouraged women to build careers in construction and commercial real estate. As president of the International Women’s Forum, she pushed for creation of a Leadership Foundation to fund a fellows program for women moving up the corporate ladder. Three years ago, Rabbitt survived breast cancer. Even before she’d recovered, she was working with the Susan G. Komen Race for the Cure and the National Breast Cancer Coalition. Rand Construction built the coalition’s new offices pro bono. In her spare time, Rabbitt has helped raise funds for My Sister’s Place, a program for battered women. If you ask her, she says she does so much for selfish reasons. “The only things you really keep are what you give away,” Rabbitt says. I am so thankful for the incredible, and generous people and companies involving themselves with The Hot Mommas® Project. Reading about Linda Rabbitt has been so inspirational (here is ANOTHER link…page down for story). Can’t wait to see what happens next. this is great. Good luck on your venture, very inspiring. The Hot Mommas Project chronicles the best practices of women successful in their lives and careers.